Labels: Blog Frog Hop and Roll, Gadget, Gardening, GH - Gen. Products, GH-Appliances, Giveaway, M.O.O.N. I live in the South and the heat and humidity seems to attract bugs. We love to spend time outdoors with our critters and kids but are limited because of bugs. This would be a big help benefiting our entire family. I love that this is solar powered. We are always outside during the summer and this would be great for when we are fishing or cooking out. It would be ideal for our lifestyle. I would use it in my back yard and on my front porch so that I can actually enjoy the outdoors with out getting eaten alive. I love that this is Solor Bug Powered and I will be using it on my patio... wan't to win because we live out in the woods and have a terrible Mosquito problem here, this looks like it would be a great way to get rid of some of the pain of getting bitten so often and that way we can enjoy being outside more often enjoying the outdoors and our yard. What appeals to me about it? Well, it kills mosquitos for starters lol. 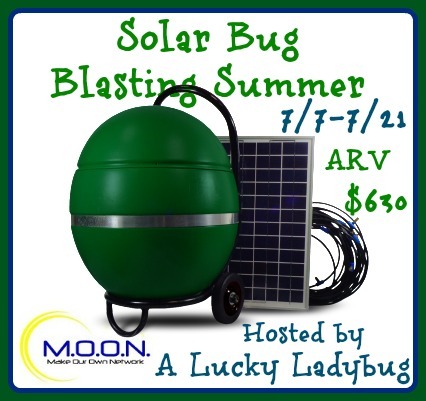 I wanna win this, because i live in the south, and our mosquitos around here are big enough to carry off small dogs! All kidding aside, my little one has what's referred to as Skeeter syndrome, and even the tiniest Mosquito bite turns into this truly bothersome bug bite on her. Of course living deep down south Mississippi, it is darn near impossible to get away from them!! So that right there would be why i truly want to win this!